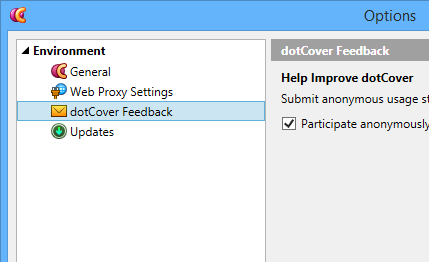 I have .NET 4.x assemblies with NUnit unit tests that I would like to run from the stand-alone dotCover application. But when I open the stand-alone app, I do not have a "Unit Testing" section in my File | Options. I only have an "Environment" section. I do *not* have Resharper installed. 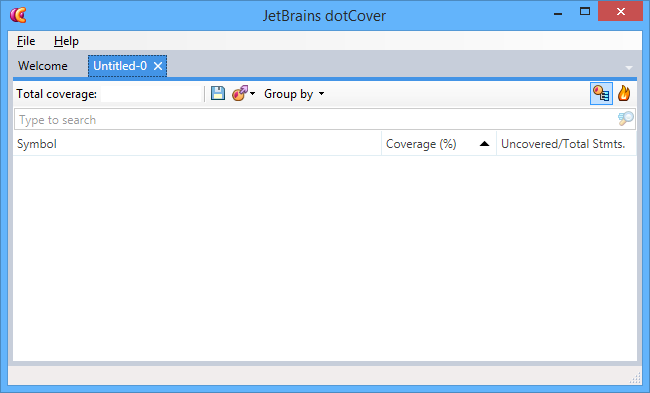 I am running Visual Studio Express, but I am *not* trying to run this from inside visual studio. 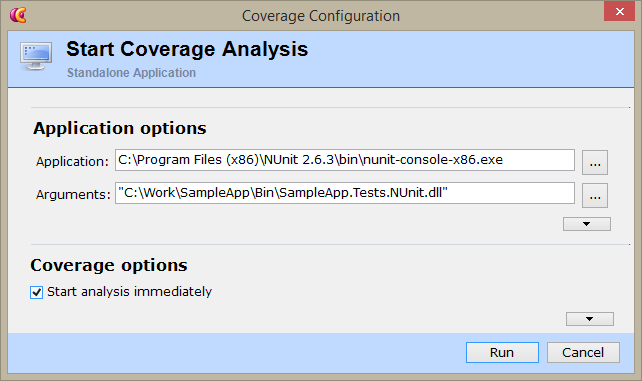 If you want to run coverage analysis for your NUnit tests using dotCover standalone, please choose the 'Standalone Application' type, specify the path to NUnit console executable file and the path to a test assembly. See the screenshot below. Thanks, Maria. I tried as you suggested, and ran all the unit tests in my application, but I had no (none, zero, blank, empty, not one lick of code or reference to my classes) results in my profiling output window. Do you actually get results for your assembly when running this way? I originally (I’d done this already) thought this was because NUnit is loading my assembly dynamically. Now I’m thinking it could be either 1) x86 vs 64-bit NUnit, 2) still could be dynamic loading of the assembly, 3) maybe I need to be using a specific version of NUnit, or some special parameters from within NUnit?
. I’m going to give this a shot.
. Thanks for your help! Thank you for the information. I'm glad that you've managed to get it working.